I just wanted to write you a quick thank you note for writing such an outstanding middle grade book! Milo is a one-of-a-kind-kinda guy! There isn't a part of this book that I didn't love...parts of it I loved so much they made me weep. I learned quickly that Milo has some obstacles-he's not graceful or popular but he does have big ideas and a kind heart. I also learned Milo misses his mom everyday and that her memory has been cleaned right out of their house by his grieving father. Since his mother's death Milo's been walking around in a fog, moving from house to house, never getting a grip on the simple fact that his mother is no longer there for him. I loved how you gave him someone to pine for in Summer Goodman and a suave alter-ego in Dabney St. Claire. You gave him a wonderful friend, Marshall, who is there to be silly with but through Marshall's family you gave Milo a way to experience a happy family. You developed another friendship for Milo by introducing him to Hillary, his annoying next-door-neighbor, who turns out to be not so annoying after all. Hillary shares with readers that we all have our secrets and our strong points. Yeah Hillary! 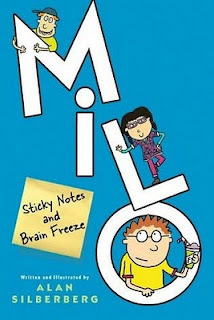 You gave Milo an adult neighbor and friend, Sylvia Poole, who shares her experiences with grief and helps Milo clear away some of his fog. You gave him a kind teacher, Mr. Shivnesky, who cares enough to give Milo a 5-minute break when things get tough. p.s. Thank you for giving Summer, the crush, some last minute redemming qualities-because after all we all have something that makes us unique! p.p.s could you please write your next book for elementary kids because I noticed your first book, Pond Scum, is also for middle school kids and I think they've had enough of your attention. PLEASE; I will be your friend for life. Check out Alan Silberberg's kooky website-Silberbooks.com. Silberberg's blog-with a book trailer.